Successful restaurant operators typically are skilled at serving great food, not managing IT infrastructure. A 4G LTE network can make the task of managing a restaurant’s digital devices a breeze. 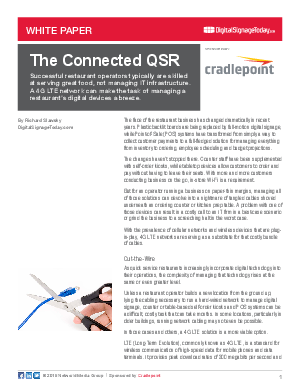 This white paper by Richard Slawsky of DigitalSignageToday.com discusses the benefits of 4G LTE Networking for Quick Service Restaurants.